Danny Kerry believes the Great Britain women's team needs a "new direction" after winning bronze at London 2012. 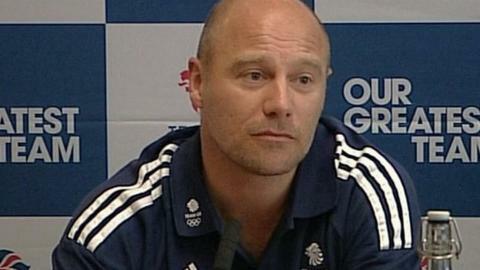 He has stepped down after eight years as head coach to become the new performance director of England Hockey. "I had probably the dream job and it's been a tough decision to leave that. "But the team needs a new direction. There was a real opportunity to become the performance director and I have strong views about where the sport can go," the 42-year-old said. Kerry told BBC Radio Norfolk he had planned to continue coaching for the foreseeable future and had not previously considered a move into an administrative role. "I thought long and hard about whether I should apply or not and then decided 'nothing ventured, nothing gained'," he explained. "Through the process I made it clear what my views were about where we could go as a sport and they [England Hockey] seemed to like what I said. "It wasn't ever my ambition or aspiration, but I'm excited now by the new challenge." Great Britain's women defeated New Zealand 3-1 to clinch third place at the Olympics, just two days after the disappointment of their gold-medal dreams being ended by Argentina. And Kerry, who believes it was the right move to "appoint from within" and ensure a continuity of approach, said his London 2012 experience would be invaluable in his new role. "Obviously, I do come with two Olympic cycles under my belt, and also having achieved medal success," he said. "So I have some idea of what's involved with the senior teams, where the opposition are going, and what we need to do to ensure we stay one step ahead. "In that respect I think it's a logical appointment for the sport." Read more on Did Great Britain's Olympic hockey teams hit the target?